Did you know all sorts of things are going on elsewhere? It may be time to admit I cannot keep two blogs going! Check in with me over here. 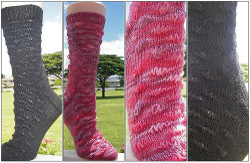 You wanted knitting, you got knitting! 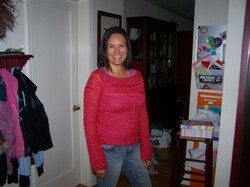 I finished my first top-down sweater today, as part of the Ready, Set, Knit knitalong with Pixie and Kathy at Webs. Made from a mercerized cotton... I'll post details when I go out to the car and grab my knitting bag. I named it Tequila Sunrise in honor of the gorgeous colorway, not in honor of how I've been getting through this week without John. So easy, so fun, so addicting! I'm ready to do another top-down. knit in the roundwith 1050 yards (one skein) of Blue Heron Yarns mercerized cotton in Tulip. Fun! Free pattern. How cool is that?? You know those days when you walk around all day with a piece of toilet paper following behind you on your shoe? I had to wear black socks with my shorts to go running because my kids have reached the stage where they can comfortably wear my socks and now treat my drawers as their own personal sales bin (not that I've actually gone running yet...). I spilled my venti iced tea all over the counter at Starbucks (and my kids weren't even close by to blame it on). My car is dirty (and it's more embarrassing when a NEW car is dirty). But I'm still smiling. Really.